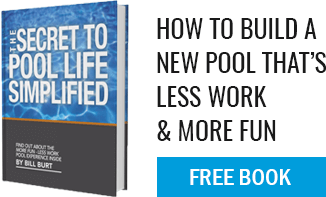 In the constantly changing pool industry, Aqua Pool is known for our ability to transform outdated pools into beautiful backyard oasis that the entire family can enjoy. If you’re tired of that eyesore in your yard, let Aqua Pool renovate your home pool to maximize enjoyment and increase your home value. 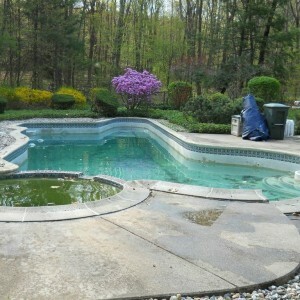 In Simsbury, Connecticut, we recently completed a project on a pool that was originally built in 1985. As you can see the whole aesthetic of the yard feels dated and lacking functionality. From the pre-cast off white coping to the interior finish, the whole pool just direly needed a make-over. We updated the coping to bullnosed concrete pavers for a modern look. When combined with a Pebble Tech finish, this pool automatically jumped several decades. Note the detail work on the stairs and in the spa with glass tile! The water looks fresh and inviting and the surrounding deck, updated with concrete patio pavers is the perfect neutral palette to bring this pool up to date.